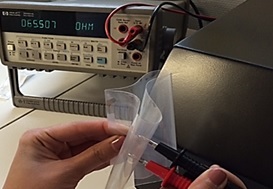 Poly-Ink, a French-based company which develops and commercialises carbon nanotubes (CNT) and silver nanowires-based transparent and conductive materials to be printed and/or coated on various substrates, has come up with a new solution to substitute indium tin oxide (ITO). Nanowire-based material combined with crystal micro fibrils (MFC) creates Poly-Ink’s so-called PolyBioWire, which is reported to offer performances that are identical or better than ITO. Sheet resistances on PET substrates can be observed and set in the 100 Ω/□ to 20 Ω/□ range, the optical transparency is around 90% in the visible range. PolyBioWire is resilient against mechanical stress thanks to its flexibility without any alteration of its electrical and optical properties. Through an innovative biosourcing process, Poly-Ink offers highly-stable transparent and conductive materials to be coated on substrates by means of various deposition methods. The MFC-concentration can be adapted in the formulation and, consequently, the viscosity can be adapted for various implementation techniques – from low viscosity for coating techniques such as slot die or bar coating, to higher viscosities, making PolyBioWire compatible with screen printing techniques. Compared to other formulations using silver nanowires, the combination of silver nanowires and MFCs leads to a reinforcement of the adhesion of the material on the substrate. Unlike other silver nanowire materials, PolyBioWire exhibits no change in its conductive properties after the ‘scotch test’. Furthermore, a comparative test, which oxidises the silver at 80°C for 14 days, does not impact the conductivity of the new product. The thin-coated PolyBioWire films can offer high transparency and low resistivity without a curing process. A simple drying process is required at low temperatures (<100°C). The material can be deposited on a variety of substrates including ceramic, glass, plastics and thin films using a roll-to-roll process. The manufacturers at Poly-Ink also claim that their new solution is the answer to the poor stability of the nanowire inks that are currently found on the market.